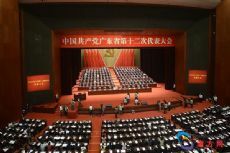 The 12th Guangdong Provincial Party Congress starts on May 22 in Guangzhou, capital of Guangdong province. Comrade Hu Chunhua delivered a work report of the CPC Guangdong Provincial Committee and said Guangdong will aim to achieve an average GDP growth rate of 7 percent over the next five years. Hu Chunhua said, following President Xi’s latest instructions to Guangdong, the province will uphold the CPC leadership, adhere to socialism with Chinese characteristics, keep the new development concepts of innovation, coordination, green, opening up and sharing, and stick to reform and opening-up. Hu added that Xi also expects Guangdong to make major contribution to support the country’s supply-side structural reform, innovation-driven development strategy and a new economy pattern of opening up. Guangdong should also lead the campaigns of building a prosperous society in a comprehensive way as well as constructing socialist modernization. Official statistics show the province's GDP rose from 5.3 trillion yuan ($768.85 billion) in 2012 to more than 7.95 trillion yuan last year. And Guangdong has topped the list of provinces with the highest GDP for 28 consecutive years. Hu also vowed to further promote the rule of law, saying that it "forms the basis of a civil and prosperous society". The congress is hosted by Comrade Ma Xingrui. And more than 900 Party representatives are attending the five-day congress, of which 32.7 percent are women, and 51.8 percent are under 50 years of age. The congress will elect the members that will represent Guangdong at the Party's 19th National Congress in Beijing this year.